His Grace the Right Reverend Bishop Mitrophan (Znosko-Borovsky) of Boston was the diocesan bishop of Boston (1992-2002) for the Russian Orthodox Church Outside Russia. Mitrophan Znosko-Borovsky was born into the family of a parish priest on August 17 (August 4 O.S. ), 1909, in the city of Brest-Litovsk (at that time a part of the Russian Empire). 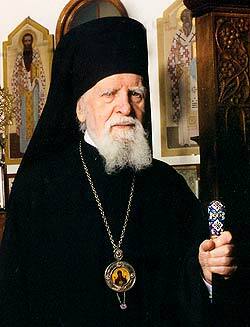 He studied at the Theological Faculty of Warsaw University, then transferred to the Theological Faculty of Belgrade University as a recipient of a scholarship from the Serbian Patriarch Varnava. Mitrophan was ordained to priesthood on June 12, 1936, a short while earlier he married his matushka, Alexandra Semenovna Tsibrouk. In 1989, Mitrophan's matushka, Alexandra Semenovna, passed away. Mitrophan was called to become a bishop in 1990, but refused a few times before finally agreeing. He was consecrated as bishop in Montreal on November 24, 1992. He became the vicar of the Eastern American Diocese of ROCOR with the title of Bishop of Boston. On the morning of February 15, 2002, on the feast of the Meeting of the Lord (O.S. ), Bishop Mitrophan reposed following a short illness. This page was last edited on October 11, 2013, at 13:32.